What Does Lexus Plan To Do With The LM Nameplate? What future Lexus could be sold as the LM350 or LM300h? Lexus has reportedly registered a trademark for the letters LM. And we're left wondering what it plans to do with the nameplate. The letter L has traditionally designated the top models in the Lexus lineup: the LS sedan, LX sport-ute, LC coupe, even the LFA supercar. What has us scratching our heads here, though, are the numbers the automaker has registered to go with those letters. According to , Lexus has applied to copyright the nameplates LM350 and LM300h, which seem small for a flagship model. Simple enough, since the RC (for example) is offered in both designations: the RC350 with a 3.5-liter V6, and the RC300h with a 2.5-liter four-cylinder hybrid powertrain. But L-level models typically pack bigger engines than those. Think LS500, LC500, and LX570. The most obvious use for another L-level nameplate would be for the forthcoming top-level crossover, previewed by the concept (pictured here). But that model would likely get bigger engines – or at least a higher engine designation – than those reportedly registered. The other plausible use for the nameplate is a more enticing one. In racing, those letters stand for Le Mans. Parent company Toyota has confirmed that it's working on a road-going hypercar inspired by its recent victory at the famous 24-hour race and previewed by the concept. 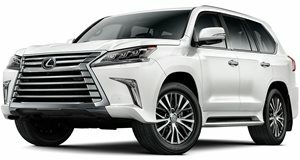 Could that model wear Lexus' badge instead of Toyota's? Maybe, if the aforementioned LFA (and rival Acura's branding of the NSX) are any indication. But again, we'd expect that model to pack more power than the 350 and 300h designations would suggest. Most likely, Lexus is simply registering the nameplates to cover future options. So we may never see the name applied to any actual vehicle. But if we did, a top-level crossover or Le Mans-derived supercar would be our best bets.